Kenny Holmberg was philosophical, as anyone with a newborn baby son would be. The Spokane Indians skipper rejoined the club Saturday after spending time at home in Kansas City with his wife and newborn son. The big smile that accompanies fatherhood quickly gave way to the realities of being a professional baseball manager. That about sums up the Spokane Indians’ 3-2 loss to Hillsboro Saturday night at Avista Stadium. 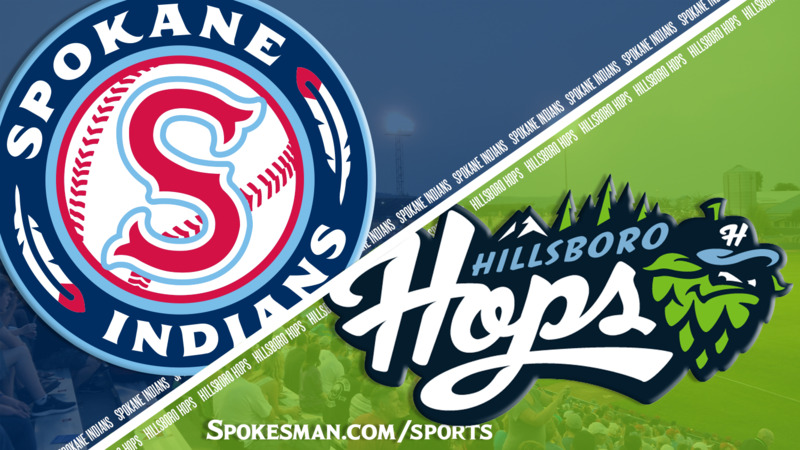 The Hops used seven pitchers to limit Spokane to four hits, with a wide swath of the game keeping the Indians hitless. Ryan Miller, who pitched the third inning, collected the win, his second. Except for left-hander Trevor McKenna, who came on in the eighth inning, the Hops sent a series of similar right-handers to the mound, and all had similar results, amassing a cumulative 13 strikeouts. Until Curtis Terry stroked a solid single to center field in the ninth to move the tying run to second base, Spokane had as many hit batsmen as it had base hits (three each). Indians starter Scott Engler had a solid outing, scattering five hits while striking out five. Hillsboro used a walk, a stolen base and a solid single to score a run in the first. Spokane was poised to answer after Troy Dixon beat out an infield single and Terry dumped a single into right field to move him to third base. But Tanner Gardner hit into a double play to end the inning. The Hops completed their scoring in the third on an RBI single by Andy Yerzy and a double by Joey Rose. Spokane’s only scoring came in the fourth when Carlos Hernandez, the third Hillsboro pitcher, opened the inning by hitting Terry and walking Gardner and Francisco Ventura. Jonah McReynolds popped out and Andy O’Banion struck out before Cristian Inoa worked a walked and Scott Kapers was hit by a pitch to plate two runs. The Indians went seven innings between hits. Ventura ripped a single to left in the eighth to end the drought. Holmberg said his postgame talk would focus on finding a way to tap into each player’s reserves and be professional baseball players. Spokane now has lost back-to-back games to Hillsboro after starting the second half with three straight wins. The Indians were a strike away from taking the opener of the five-game series Friday night before the Hops rallied to win in 11 innings. The bright spot on Saturday, Holmberg said, was the way Spokane’s bullpen responded to shut down Hillsboro after the third. Ryan Miller pitched a solid inning of relief in the sixth and Austin Pettibone, in Spokane on a rehabilitation assignment from the Down East Wood Ducks, got two outs in the seventh before running out of gas. Werner Leal came on to throw the final 2 1/3 innings. Published: July 28, 2018, 11:01 p.m. Updated: July 28, 2018, 11:11 p.m.